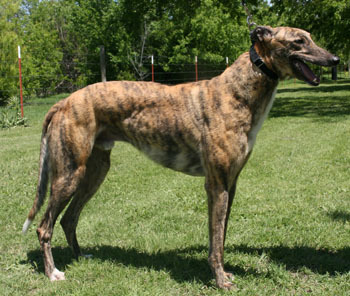 Bolts, aka Loose Bolts, is a 3½-year-old brindle male born June 16, 2009. His sire is Swahili Elie and his dam is Red Hot Victory. 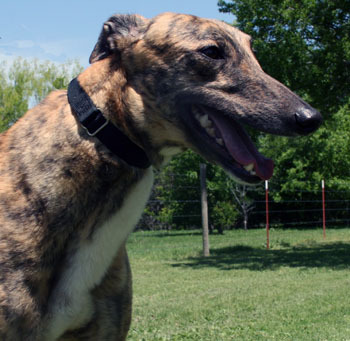 Bolts has 64 races on record at greyhound-data.com, all at Bluffs Run, Iowa. He started his career on January 25, 2011 and finished it on September 28, 2012, amassing 8 wins over the duration. Will Bolts bolt his way into your heart? Bolts does well with very small dogs. 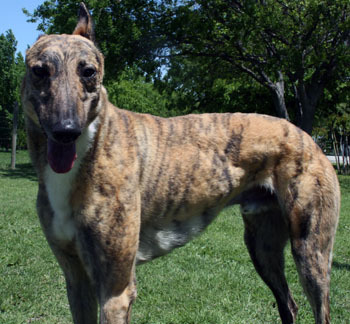 He has passed an initial cat test, but needs to spend time in a foster home with cats. It has been a real pleasure having Bolts as part of our family. He is our first foster and we are amazed that every day we can see a change in him as he becomes more comfortable with living in a home. He started by simply just laying on his bed and watching our other dogs play - now he is comfortable enough to go into their toybox & get a toy and has even started to play with the other dogs. House training has been remarkable - he has had ZERO accidents in the house. He loves his walks and stays right by my side. He definitely loves being with his family and if we get up, he makes sure that we are in sight and if not, he gets up to see where we are. He sleeps through the night now and enjoys his morning walk and seeing the rabbits & squirrels that are out at that time. He will be a wonderful addition to his Forever Home.